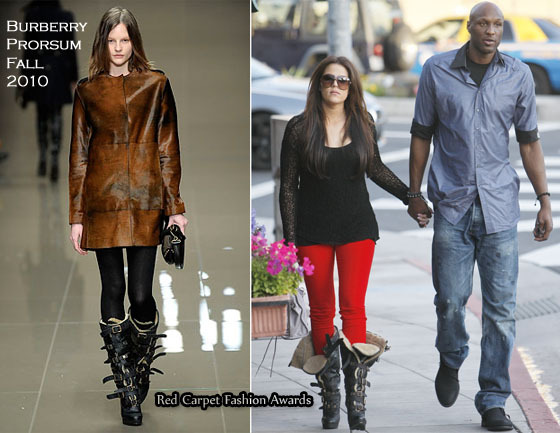 Khloe Kardashain and Lamar Odom were spotted dining together at Cafe Med in West Hollywood this week. The reality TV star opted to wear a black lace long sleeve top with J Brand skinny leg jeans. I can deal with the red jeans – I used own a pair in the 90s so I don’t feel I can judge – but I really dislike the sloppy way she’s wearing her Burberry Prorsum Fall 2011 shearling boots. Each to their own, but I think they look better buckled up. She must really like these boots because she also owns the ankle boot version. A dove grey Balenciaga bag completed her look.